Remove engine cover. Refer to Engine Cover Replacement. Remove the fuel feed pipe from fuel injection fuel rail. Refer to Fuel Feed Pipe Replacement. Remove the positive crankcase ventilation pipe from the intake manifold. 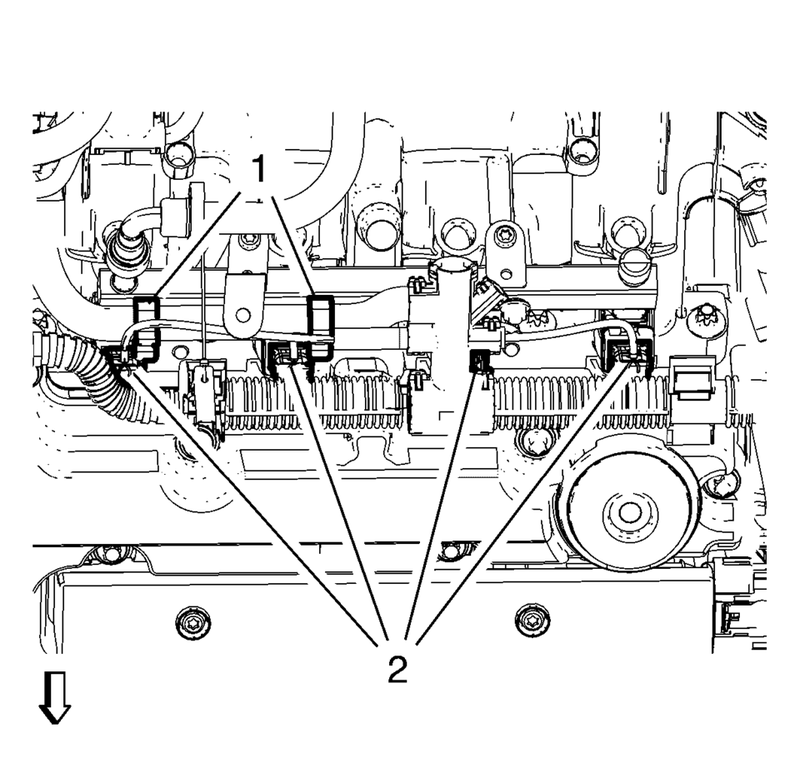 Refer to Positive Crankcase Ventilation Pipe Removal. Disconnect the 4 fuel injector wiring harness plugs (2). Unclip the ECM wiring harness from retainer clips (1) and the camshaft cover. Remove the ground cable nut (2) and the ground cable. Remove the 2 fuel injection fuel rail bolts (1). 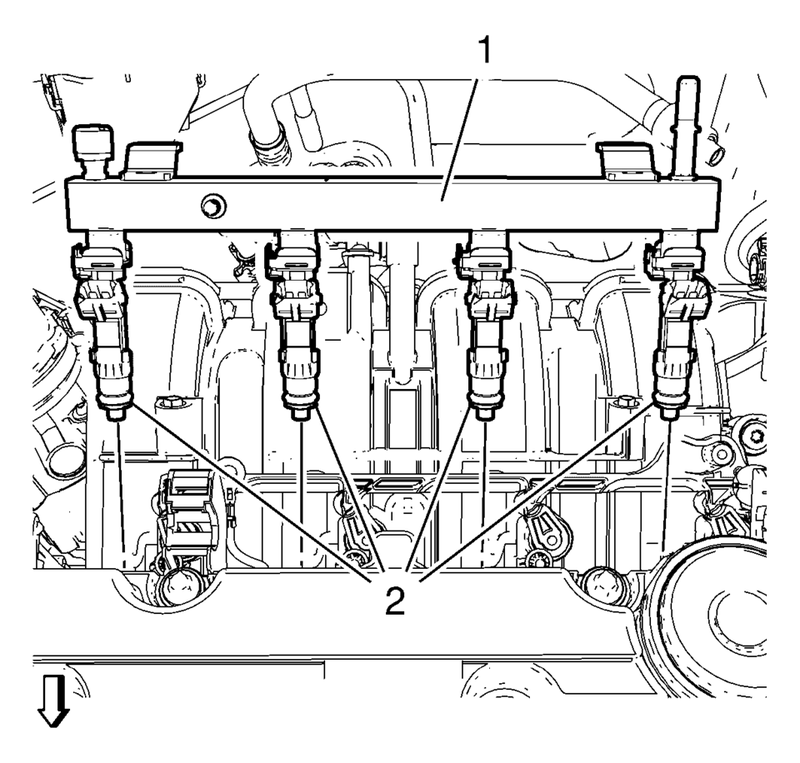 Remove the fuel injection fuel rail assembly (1) and the 4 fuel injector seal rings (2). Lubricate the 4 fuel injector seal rings (2) with clean engine oil. Install the fuel injection fuel rail assembly (1) to the intake manifold. 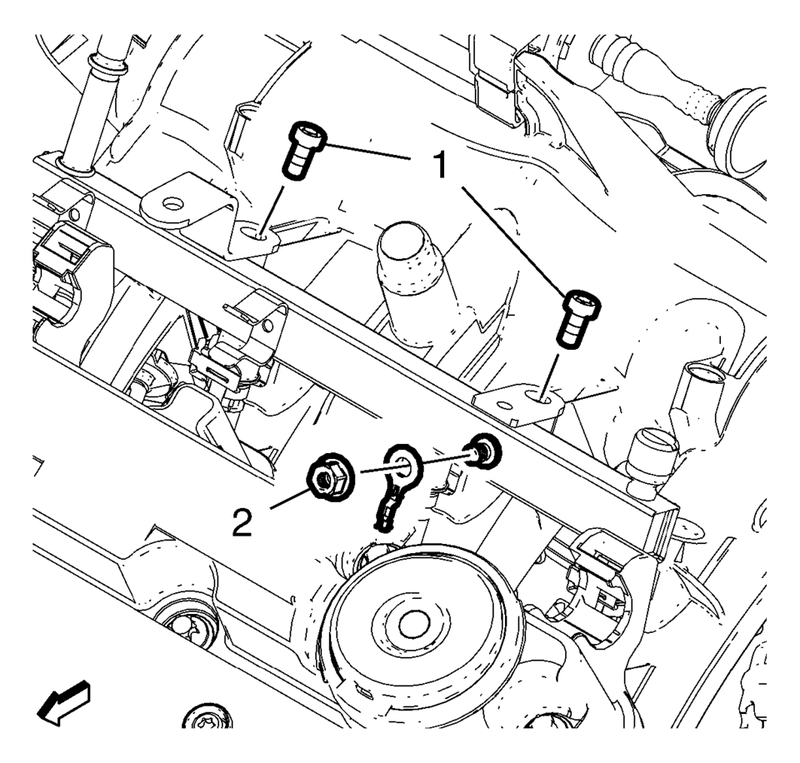 Use NEW fuel injector seal rings (2). Install the ground cable and the ground cable nut (2) and tighten. Connect the 4 fuel injector wiring harness plugs (2). Clip the ECM wiring harness to the retainer clip (1) and the camshaft cover. Install the fuel feed pipe to the fuel injection fuel rail. Refer to Fuel Feed Pipe Replacement. Install the engine sight shield. Refer to Engine Cover Replacement.